Run Dorothy Run has a simple story narrated by the Wizard himself and a flying monkey who join you on each stage. You are given a pair of shoes that walk on their own, so your only focus is what’s happening in front of you. Your goal is to take down the wicked witch of the west after your house crushed her sister when you landed in Oz. Across eighteen stages, you’ll use two Move controllers, represented in-game as wands, to hit gems as they pass in front of you. The gems appear at your sides, above you, and below you as well. Sometimes you’ll encounter running sets of them that require you to follow the shape with your arms to maximize your score. The game should be played standing and with plenty of space around you for the best results. You’ll move around a lot. I broke a sweat pretty quickly as I ducked, weaved, and reached to hit as many gems as I could. Later levels throw in some enemies to contend with, but the general gameplay loop remains the same. You can choose from three different difficulty levels, and shoot for five-star ratings to enhance the replay value, but all of that will depend on how much you enjoy endless runners like this one. While it doesn’t reinvent the genre, the controls worked well for me, and the premise was unique enough to grab my attention from the get-go. There’s a nice level of challenge and rhythm to the levels. You won’t get a perfect score on your first try, even if you put the difficulty all the way down. A simple, but satisfying gameplay loop and some genuine exercise potential make Run Dorothy Run stand out from the pack, but how does the rest of the package hold up? The graphics in Run Dorothy Run are very simple. Environments are usually basic layouts with some scenery. The color palette does change across the levels, but the barren design remains the same. While it would have been nice to see the more interesting scenery in the environments, the simplicity also keeps distractions to a minimum. A game like this can really benefit from a great soundtrack, and while Run Dorothy Run does have an upbeat set of tracks with some jazzy influences, it doesn’t do much to differentiate itself from other similar titles in this genre. The Wizard and flying monkey, particularly the former, can also be quite distracting when you’re playing. The Wizard is constantly talking while you’re trying to focus, and he rarely says anything positive about you or your efforts. At launch, the voice track was far too loud and practically drowned out the music for me. The game has been patched to balance the audio levels, but I still don’t know that the Wizard’s narration is really necessary in a game where the music and focus should be at the forefront. 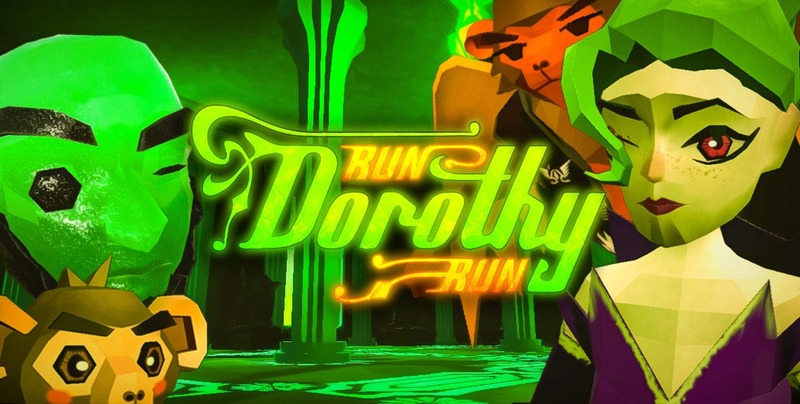 Run Dorothy Run is a solid endless runner with sharp visuals and a cool premise. With more mechanics, a stronger soundtrack, and fewer distractions from the narrator, it could have been a major step forward for the genre. If you’re looking for an endless runner on PlayStation VR, this is a good pick, but don’t expect anything drastically different than what you’ve seen before.